Well, Happy New Year's Eve-eve to all y'all! One of my fave things to do during this time o' year is to look back on the past and reflect on some of my happiest memories. I've been doing this the past coupla years and I really enjoy it (you can visit 2012 and 2013 here if you so desire). I hope you don't find it nearly as torturous as those Facebook "This is my life in a coupla rando posts and pics that some pimply teen working at FB picked for me. Thanks for being apart of it." thingies that keep clogging up your newsfeed. If so, my sincerest-ish apologies. For humoring my self-indulgent reflectin', I've got a giveaway for y'all! One of my fave things about 2014 was that I started the Artsy Book Club. We started out with a BANG! reading One Drawing a Day and really having fun with it. The prob? Drawing each and every day is taxing, y'all. However, I did love the bond we created. My next book club read was a double header (Teach Like a Pirate and Printmaking Unleashed) which I think was a big ole mistake. I was overwhelmed trying to read them both. So this time around, I'm throwing a book out there that I've been meaning to read for ages and I think we'll all benefit from and Ima gonna give one of you a copy! So, what's the book, you ask? 1. Leave me a message in the comments about what was your fave memory from 2014. 2. Don't forget to include your email address! I'll let you know by Sunday, January 4th. We'll begin officially book clubbing on Monday, January 12th. There are a million inexpensive copies of the book in the used section on Amazon (that'd be where this giveaway copy came from!). 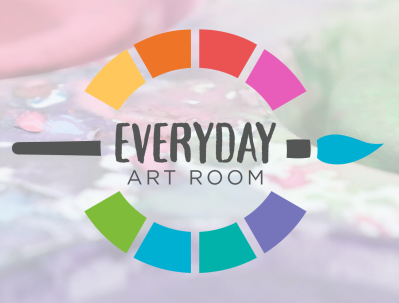 I do hope you'll join the Artsy Book Readin fun! 1. 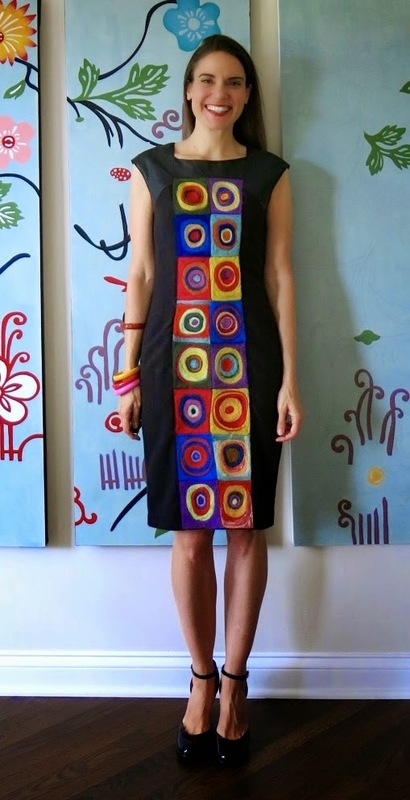 My Artist-Inspired Dresses. The craziness continues. 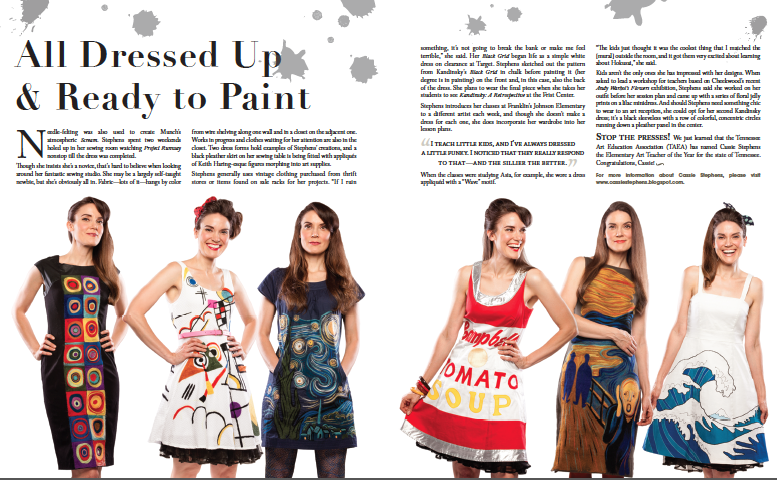 I started this artist/artwork-themed dress thing last year after creating The Great Wave dress. My most recent one was this Lichtenstein number (I've got a couple on my sewing room table right now just waiting to be created). 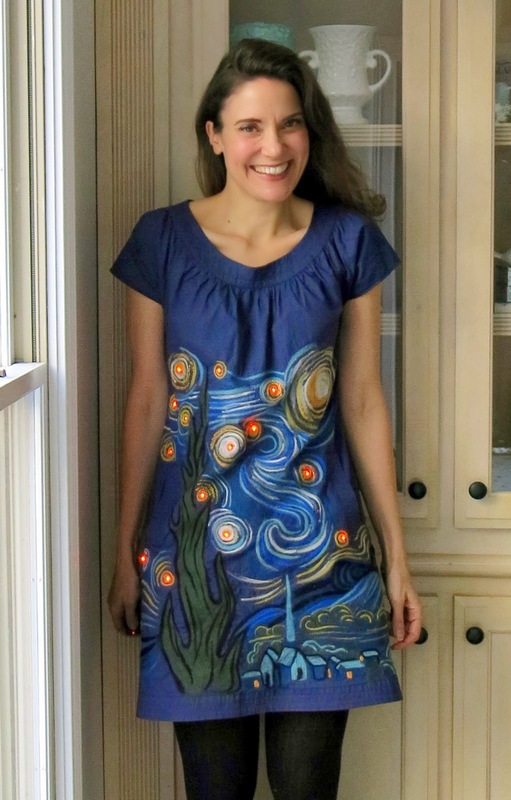 This Starry Night Dress was actually started at this time last year over winter break. The light up part is my ab fave. Woof, this entirely needle felted The Scream dress had me seriously questioning my life's choices. It took me foreverness. I don't wanna even know how many hours were poured into that dress (although I do know that about 3 seasons of Project Runway were watched whilst needling away). I took a lil hiatus from needle felting after that number. 2. 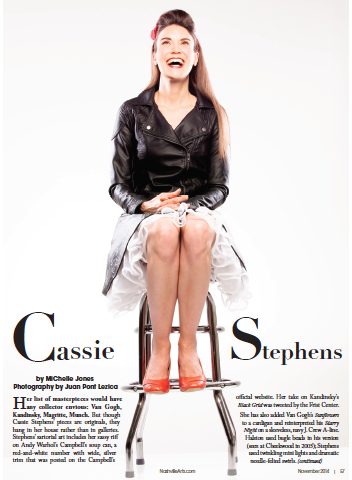 Feature in Nashville Arts Magazine. From the interview to the photo session to seeing it all in print, that was easily one of the coolest things of 2014 for me. You can view the entire interview here incase your eyes cannot read flea-sized font. And you can read all about that photo session and interview here. 3. The Artsy Sew Along. 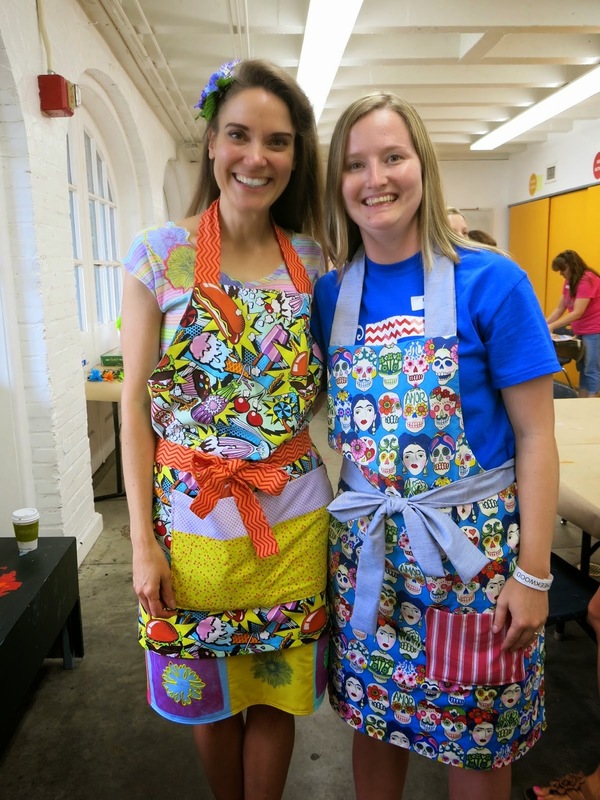 Originally just called the Apron Sew Along until we finished the aprons and people kept joining the fun (I love Denise's Frida/El Dia de los Muertos apron, don't you?)! 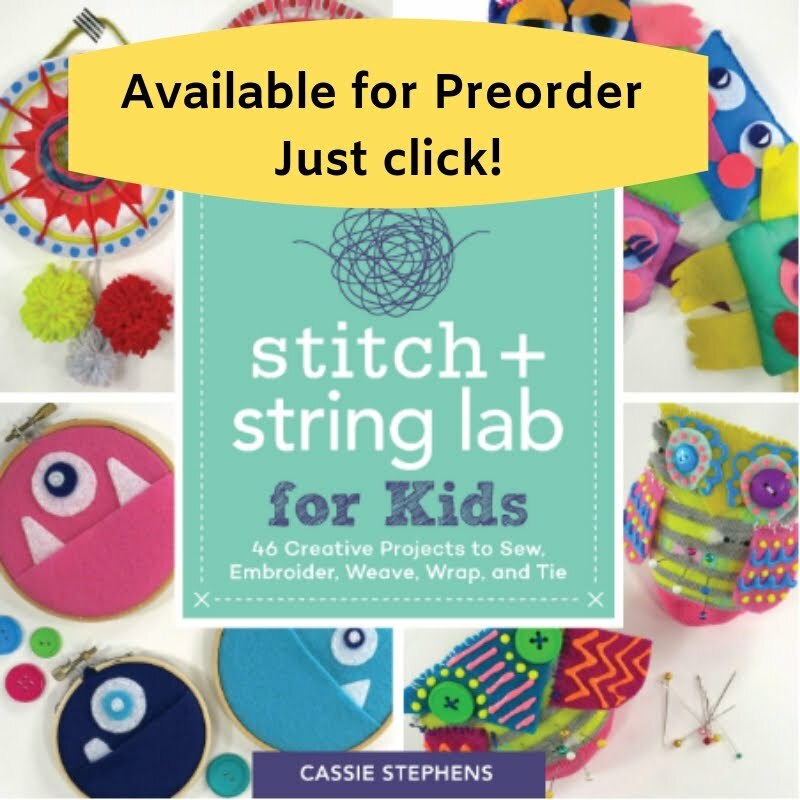 I've got a new sew along project in store for us so if you join here, you'll be able to stay informed. If you are still wanting to get your apron stitching on, go here. There's all the links to the videos and tutorials you'd ever want (well, not really. But it's a start). 3. Going to NAEA in San Diego. Twas an absolute blast! It was basically Art Teachers Gone Wild which is always the best kind of party. I'm most def going this March (and leading two sessions, whuuuh?! Y'all best come and hold my hand, ermkay?). 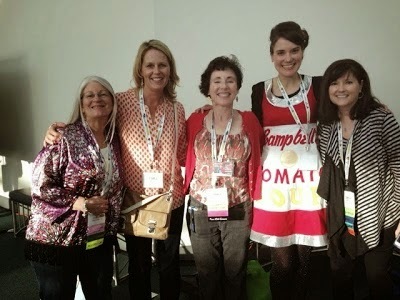 I loved meeting some of my fave bloggers and awesome art teachers. From left to right, that's Phyl, Patty, Rina and the lovely Donna. If you click on their names, you will be blown away by their awesomeness. 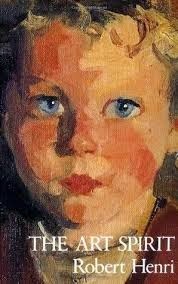 And of course, Nic Hahn of Mini-Matisse! Like, seriously the nicest gal everrr. 4. Leading my first professional development at Cheekwood Botanical Gardens. Y'all. 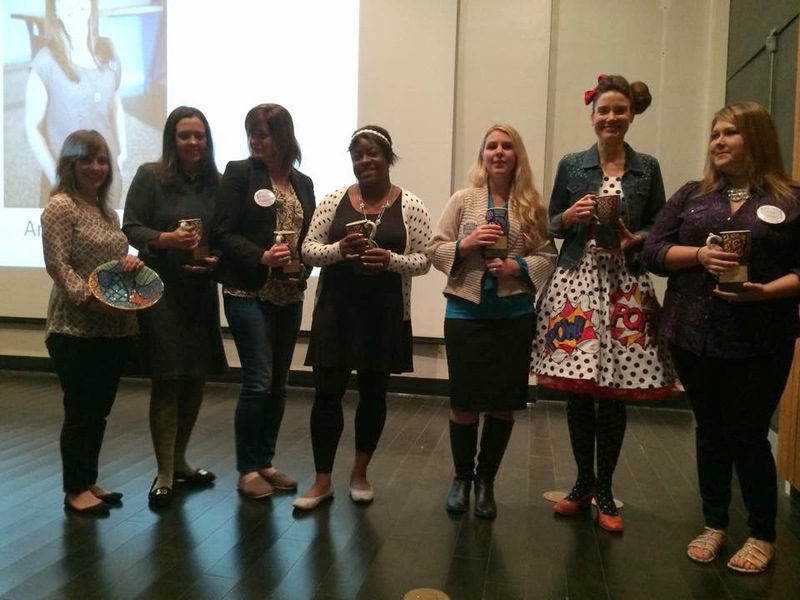 I was so super nervous to be leading that workshop! I mean, I'll teach kiddos all day long but other art teachers?! Who am I to tell 'em what to do? 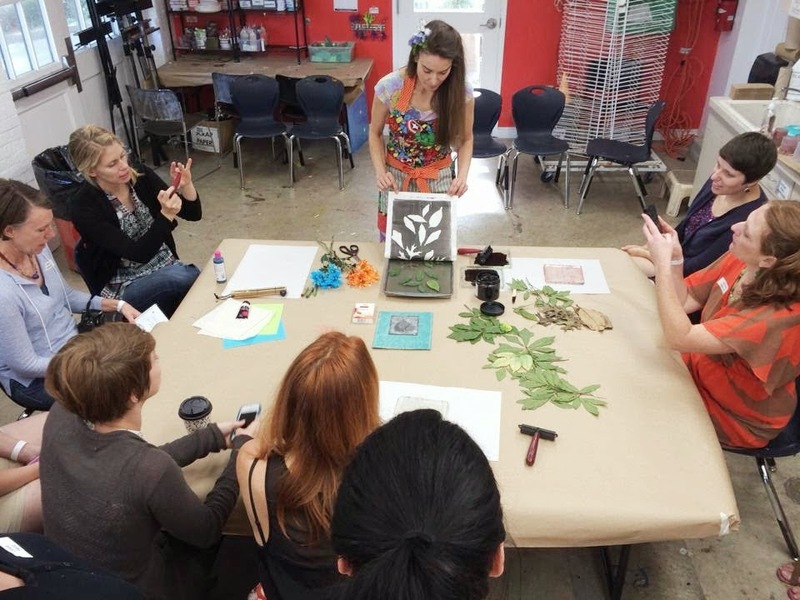 My nerves were set at ease by that awesome group of art educators and it was such a fun experience that I can't wait to do it again. 5. Speaking at Bowling Green State University. That was another spooky/thrilling experience that I absolutely loved! 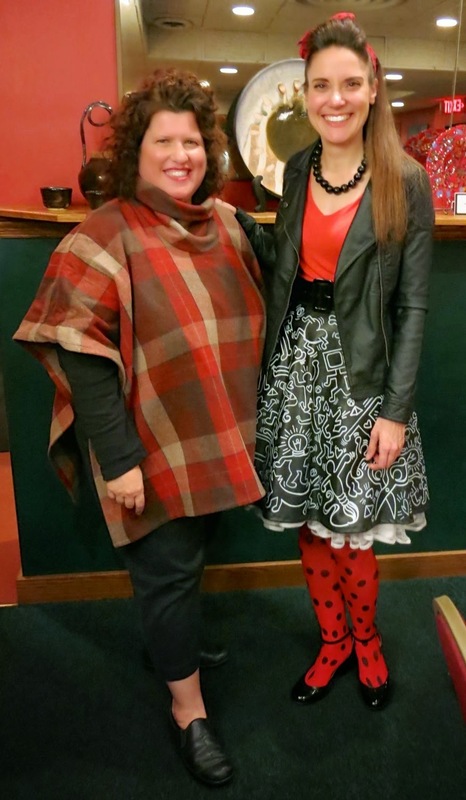 Although, I gotta tell ya, my fave part was meeting Laura Dean of Painted Paper. Her blog is insanely creative and always an inspiration. 6. Gallery of Gratitude. As art teachers, we hang artwork in the hall all the time to boost the kid's self esteem and to show off their hard work. However, it's not often that we create art work to booster the esteem of others and congratulate them on their hard work. But that's just what our Gallery of Gratitude did. And the impact it had on my coworkers was very touching. This was easily one of my fave art projects of 2014. 7. 4th Grade Legacy Mural. This project was one that came to me two weeks before winter break. The idea: have my 4th grade kids create a legacy for the school and present it as a Christmas gift before winter break. Getting this completed caused multiple panic attacks but with the help of my buddies the custodians, the bookkeeper, my librarian buds and all my fab fourth graders, it was finished and revealed to our principals. 8. String Art Project. 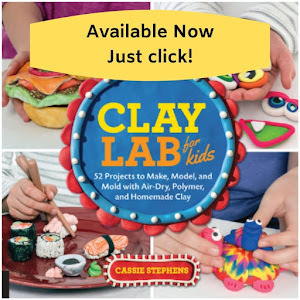 This project was both a student and blog reader favorite. If you've not given this a go, I really recommend you do. Each and every kid loved it and was successful. And now my 3rd graders are begging to create one as well. I've got an alternative in mind for them that I can't wait to start after break. 9. Circle Loom Weaving with 2nd Grade. This one was another blog reader/kid fave. Do y'all weave in your art rooms? It's one of my favorite things. In fact, I'm declaring January Weaving Month by hosting a weaving lesson each week on this here blog. I'm also presenting all-things-weave-y at the AOE conference at the end of January! I'm so looking forward to that. Are y'all going? 10. 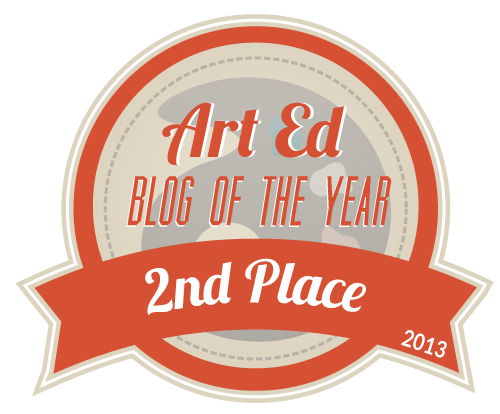 2nd Place Art Education Blog of the Year. Speaking of the Art of Education, this was a super nice surprise this year (I know it says 2013 but it actually went down in 2014)! I was thrilled just to be nominated. Shoot, I'm just glad that there's five of you out there that read my ridiculousness! 11. 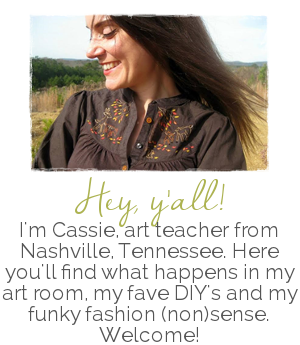 Tennessee Elementary Art Educator of the Year. Well, that was a super nice surprise! Especially the part where I'm surrounded by some outstanding art educating action like these lovely ladies. Guess who didn't get the "Professional Attire Required" memo (as if I have any clothing that falls into that category!). 12. Hiking Mount Baldy. Like, wow, y'all. That was a tough hike the hubs and I did this summer. But outta all the hiking we've done, this one was one of my faves. The views were amazing. Like, right? Once we caught our breath the view was even more breath taking. 13. Halloween Horror Nights at Hollywood's Universal Studios. The hubs and I have been going to HHN for years. It's like our fave thing in the world. Seriously, the hubs loves it so much, he starts planning our trip in May. I was able to get this frightening clip filmed while standing at the front of the entrance to the park. Just watching it still makes my hands sweat. And to think we pay money to get chased my these maniacs! 14. A Ladies Trip to Charleston. Me, my moms and my moms-in-law traveled to Charleston this summer and completely did the town. I'd never been before and the whole place was such a fun and unique experience. Fave part: the dolphin sightings right after these photos were taken. So fun! Hey, strangers! It feels kinda weird that I've not chatted with you in a coupla days. I mean, that whole blogging daily thing, whilst a wee bit taxing, was so fun. 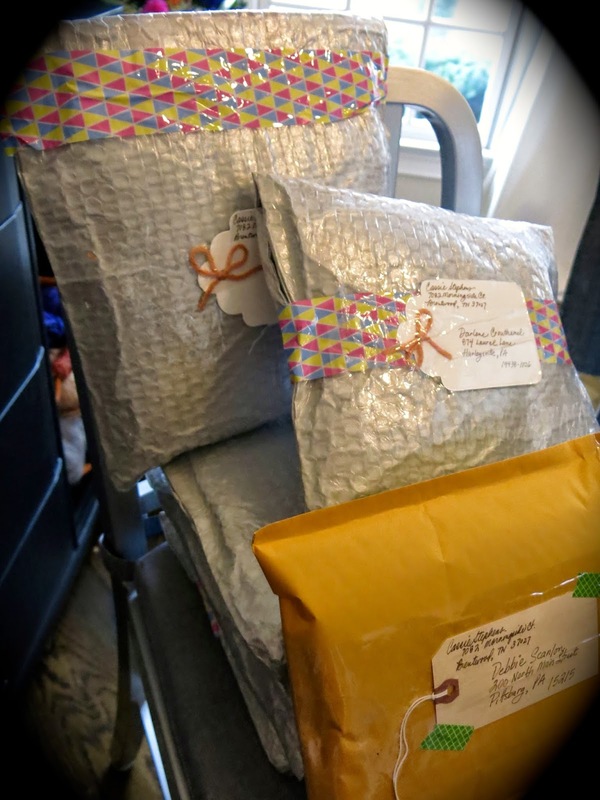 I loved being able to overload you with my backlog posts and giveaway some goodies. But what I especially loved was hearing from so many of you! It's so easy to glance at blogs and move on to the next without dropping a line. I'm toootally guilty of it. But as a person who throws her goofball ideas out to the interwebs, it's nice to hear a response. So, thanks, kids! I'm excited about what's in store on this here blog in the next coupla months. I plan to restart the Artsy Book Club (book announcement as well as a book giveaway coming very soon) as well as the Artsy Sewing Along. I do hope y'all will join the funness. Stay tuned for deets. Oh! I almost forgot! The winner of the final giveaway is...Rebecca Ednie! Thank y'all so much for playing along. You're the bestest. Until next time, have a great week, kids. OOooooohhhh, and one last thing. Can we please talk about the satanic elephant that's in the room? Look over to the right of your monitor, wouldya? I'm at "666" followers. Please make it so this isn't the Blog of the Beast, would you kindly? Just a click on the "join this site" would make my day so grand and demonic free. I got a plethora of exceptionally good gifts for Christmas (the hubs spoiled me with a half dozen dark chocolate bars and Disney Starwars pins. Don't be jelly). Best gift? 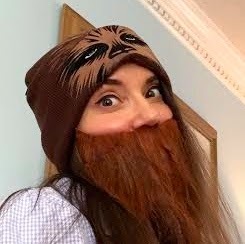 This Chewbacca cap and hubs-wannabe beard. I'm thinking the beard will be perfect if ever I decide to dress as van Gogh. Although, I gotta tell ya, I was hairball-coughing up faux beard hair for the rest of the day. Merry, cough-cough, Christmas, y'all! Merry (almost) Christmas, y'all! Ima gonna hafta keep this here post short -n- sweet as I'm so stinkin' tired I can't even think straight. I was up last night workin' on this lil number until the wee hours of the morn. I was only down to a sleeve and zipper install but that still took me til 1am. Which should mean that the whole thang is gloriously perfect. Howeverness, I created it. Therefore, 'tis not. If this dress pattern looks vaguely familiar to you that's cuz I used the same Emery pattern that I had in the creation of this Christmas dress. In fact, I created them both in tandem with the exception of the sleeves and zip. I've never created two dresses simultaneously before and I kinda liked it. Despite the slight sweatshop vibe, I loved that I was busting out two frocks as once. However, even though I love the Emery pattern, I kinda feel like it's a lil too high waisted for me. The dress waist seems to hit a good inch or two above my true waist. With a belt, I don't think you can see the dif but without, I kinda look like I'm in a kid's dress. Or is it just me? What do y'all think? I would also like it if the dress was about 3-4 inches longer. A longer length might give it more of a vintage-y vibe? However, I do love the fitted bust and the simplicity of the sleeve install. On a dif note, I gotta say that as an artsy type, I really don't know if I should be dabblin' in such things as knitting (oh, I've not shared that mess with you yet.) and sewing. Cuz they are, like, precise kind of crafts, for lack of a better word. I mean, you gotta get those pieces cut and stitched just so; those knits and purls just right or else the whole thing is a disaster. But as an artsy type (I hesitate to use the word "artist" cuz, well, have you seen half of my DIY's?! ), my solution to an oops is to hot glue something over it. Which, sadly, you can't do to a dress. Or a knitted scarf. Cuz I've tried. Despite that, my desire to create uber tacky art teacherin' garb overrides my slight dislike for the technicality of stitching. I just need to find a fabric friendly hot glue, I guess. By the way, did y'all notice the serious furry photobombing that's been happening in this post? So I got the genius idea to attempt some kitty-cat Christmas pics. Someone was not convinced this was a good idea. Like really not diggin' it. And game over. "I said, put me down right meow!" Yes, ma'am. 1. Tell me just one of your New Year's resolutions. Does it involve creating more? I know mine does! 2. Don't forget that email addy, kids! And yesterday's winner? Young by Design! Congrats, buddy. And Merry Christmas, y'all! Have a wonderful time with friends and fam. So this lil repousse snowflake by my fourth graders just might be the fastest art project we bust out this year. Not that I'm bragging. I do believe those canvases coulda used a lil more work. However, I needed something short, simple and fun after our super long Mexican Sun/Moon weavings and this did the trick nicely. Just like this third grade paper cutting project, we discussed Mexico and the art of papel picado. I stumbled upon a couple of prezies on the art form which was great to share with the kids. 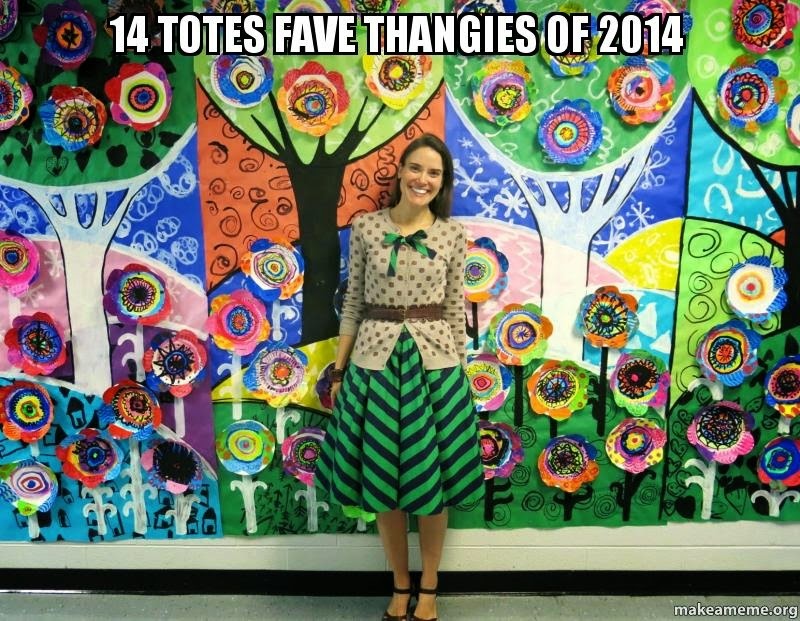 I also have several examples of papel picado hanging in the art room so they could get the idea. So our first course of action: Cut some paper designs (I hesitate to call these "snowflakes" as they don't exactly meet the criteria but whateves). Once the kids' designs were cut, they brought them to me where I placed them on a piece of 5" square matte board that I'd ready cut and doused in spray adhesive. Another hit of spray adhesive and a piece of 7" square aluminum foil was placed atop. The kids were instructed to return to their seats, fold the excess foil to the back and massage the surface with their finger tips only (no nails, y'all) until their design appeared. With the long winded chat and all that work, this took us about an hour. In preparation for the following class, I'd spray painted each of the boards very lightly with the cheapest spray paint I could find (the dollar a can stuff from Home Depot is my jam). When the kids arrived, they were instructed to use 000 steel wool to burnish off the spray paint. They were thrilled when their design started to appear. That took them no more than 7 minutes. If this process looks vaguely familiar, I've done it with leaves as well. If you follow this link, you'll get a better glimpse at the step by step process. From there, the kids were each given a 6" square canvas. They traced the placement of their piece (I showed them an example of a diamond placement or a square. Guess which one was more popular?) and then commenced painting. I limited their palette to the cold colors (these are kinda sorta snowflakes, y'all. So we went with a winter palette for that reason). The only instructions I gave was a reminder to clean that brush between color switching and to keep the painting abstract (lines, shapes and color). The last 30 minutes of the second art class were spent quietly painting these canvases. Once dry, I added a touch of hot glue to the back of the repousse and attached. Boom! Done! Ready for hall display. And now, on to the giveaway! Check out this huge pile of packages that I took to the post today. I hope y'all have been enjoying this giveaway as much as I have. It's been super fun. And, to be honest, what I've loved the most is reading all of your comments. So often, it's hard to leave comments on a blog or, quiet honestly, it's just easier not to (I'm very guilty of this so I totally get it). Which means, at times, I feel like I'm talking to myself because I don't often hear from y'all. So having this exchange with you has really meant a lot to me, thank you so very much for playing along. So, what's up for grabbies today...? All sorts of glorious vintage goodness! Two lovely vintage alteration booklets, two packets of vintage buttons, a little needle booklet and an iron-on embroidery pattern set. So many pretties in one giveaway, ya'll! 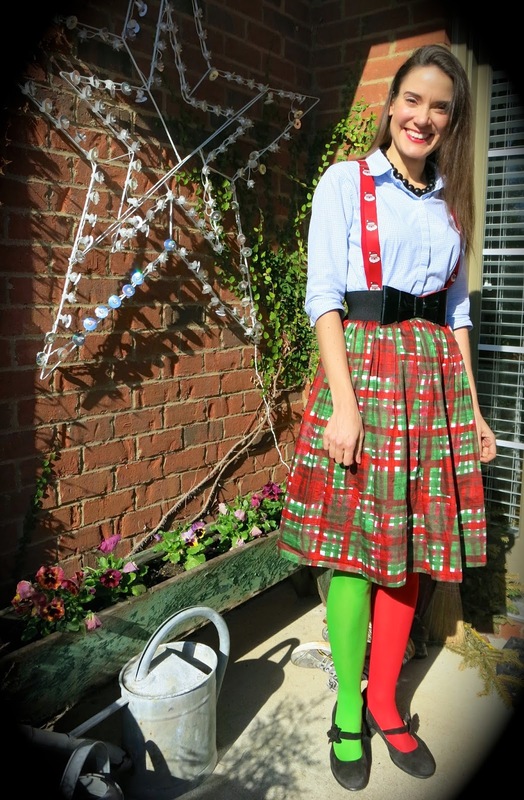 Vintage-lovers, this is right up your alley! 1. So, it turns out that A LOT of y'all want that needle felting kit! My question to you is...if I were to sell them, would you be interested? Would there be any other artsy kits you'd be interested in? 2. Don't forget to add that email address, kids. Tomorrow is THE LAST of the giveaway goodness, eeee! And the winner of that needle felting kit?! Tracy Evans! Congrats, buddy! In the Art Room: How to Draw Penguins! In the Art Room: Kindergarten Reindeer!